Yo definitely noticed that for various reasons we need to connect male and female USB of various types to breadboard. It is not practical to cut each type of USB cables for each projects. Here is how to create your own DIY Universal USB To Breadboard Connector with one male to female usb cable 8 jumpers and basic tools. Select same coloured 1 set of jumper wires – black, white, green, red cables male to male jumper wires. Cut then in the middle with knife. Strip the wires and twist the copper wires. Then twist to join with the same coloured exposed black, white, green, red cables of USB male and female ends. Use electrical insulation tape to wrap them. We have finished the work. What Each Colour Of USB Cables Do? It is obvious that black is GND and red is 5 Volt positive. Rest are white, green cables which are for data. D+ and D− signals are transmitted on a differential pair, providing half-duplex data transfers for USB 2.0. Mini and micro connectors have their GND connections moved from pin 4 to pin 5, as their pin 4 serves as an ID pin for the host/client identification. Guides will be written where to connect the D+ and D− (white, green). You need not to know them in details. This Article Has Been Shared 8948 Times! 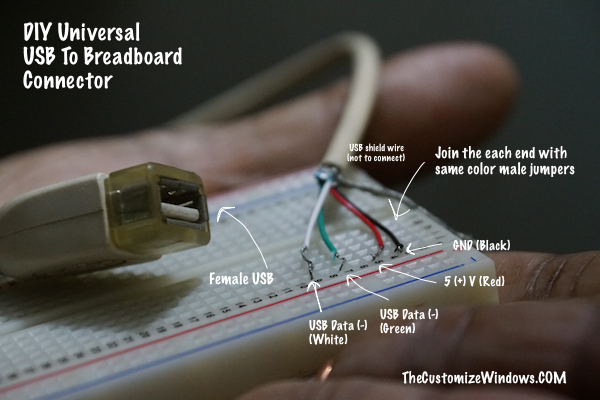 Cite this article as: Abhishek Ghosh, "DIY Universal USB To Breadboard Connector," in The Customize Windows, June 19, 2017, April 21, 2019, https://thecustomizewindows.com/2017/06/diy-universal-usb-breadboard-connector/.